On April 5th, we will be rolling out an update to the Daily Lesson Plan that includes many of the improvements that you've been asking for over the last couple of months. Please read below for an overview of the changes. These changes only pertain to the Daily and Weekly View of your Daily Lesson Plans. There are no changes to the Subject Lesson Planner at this time. We've streamlined the processing behind-the-scenes to improve load times of both the Daily Lesson Plan and the Weekly View of your Daily Lessons. Switching between the Daily View of your Lesson Plan and the Weekly View is now faster as well. No more pop-ups for editing Information Blocks, Objectives, and Notes - you can now edit-in-place right on the document itself and see your changes as you enter them in real-time. And, we now save your changes in real-time as you make them. You will still instant edit your Standards the same way you've always done by clicking on the standard to get the pop-up with the Standard Tree and Keyword Search options. *In a future update, we plan on allowing for the editing of the Lesson-Set Components and Vocabulary directly on the Daily Lesson Plan as well. You can now edit directly on the Weekly View of your Daily Lesson Plans! This page can be used as both an overview of your week as well as a place to edit your week-at-a-glance without having to swap between your different daily lesson plans. Adding Information Blocks is now streamlined into the Daily Lesson Plan - you no longer navigate away to a separate page to enter your Information Block details. Now, you can choose the type of block you wish to create (Inline or Vertical) and we will create an empty information block right on the page that you can immediately start editing. Inline blocks are created at the top of your lesson plan (you can still use the Move icon to drag+drop them to the correct spot), and Vertical blocks are created along the bottom of your lesson plan. Editing Information Blocks, Notes, and Objectives is easier. 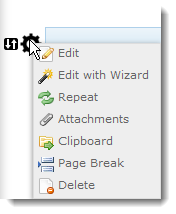 Simply click on the text you want to edit and start typing. We save your changes automatically. Your Daily/Weekly Lesson Plans now have much tighter integration with your selected Color Theme. You now edit Information Blocks and Lesson Blocks the same way. You can edit your Lesson Plan directly on both the Daily and Weekly views. We listen to the feedback we receive and revise the software to meet your growing and changing needs. We always prefer to roll out new changes as soon as they are ready instead of waiting to push them out once or twice a year. We also prefer to roll them out during the school year while lesson planning is fresh on your mind and it gives you a chance to get familiar with the changes while you are already actively planning lessons. These improvements were designed to increase usability and we know you're going to love them. As always, if you have other suggestions to help improve the software, simply send them our way. We are listening!